Kitchen designs walk a fine line between style and function, and must be the ultimate multi-tasking space. From a quick breakfast before school or work to relaxed dinner and drinks with friends to a large family gathering or party, kitchens see a lot of activity. 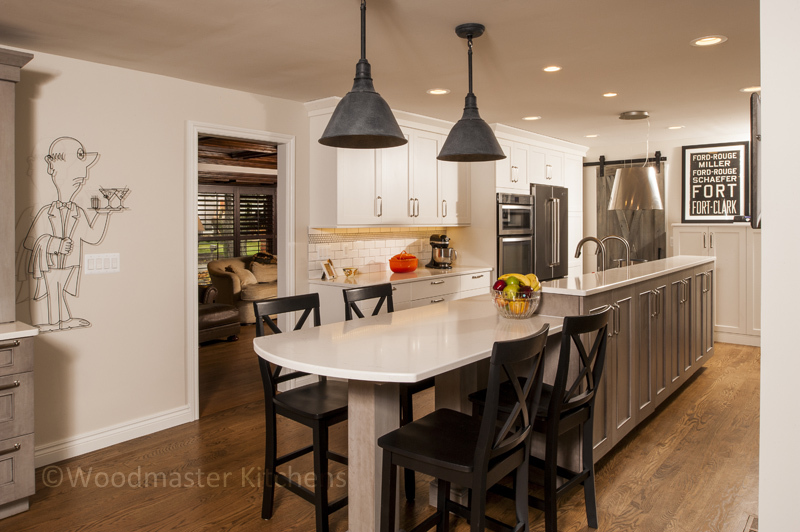 It is no small task to create a space that meets all of these requirements, but an experienced kitchen design specialist can you help you achieve your goals. The kitchen is not just a utilitarian space designed only for cooking meals. You will ultimately live, work, and socialize in your new kitchen, so use the design process to make this space your own. Go beyond the functional requirements of your space to create a warm, welcoming room that brings out your personal style. Open shelves or glass front kitchen cabinets can be included in any style kitchen and offer a prime opportunity to display personal items such as your fine glassware or a collection of sculptures. They can also serve to break up the appearance of standard cabinet fronts or the kitchen island cabinetry. Use a multi-layered lighting design to illuminate favorite personal items or to light up key design features like a tile focal point. Light fixtures themselves can also add personality, particularly unique pendant lights or chandeliers. These are the unique touches that really make the space your own. Include a painting, sculpture, or other wall hanging that shows your style. Or, perhaps incorporate a custom designed sign like this stainless steel corner wrap. Do you plan to host elegant dinner parties in your new kitchen? Or perhaps you expect to accommodate family dining and the occasional coffee with friends? Your kitchen’s seating arrangements will reflect the style of your home and the way you plan to use the space. Include a spacious dining table or a small round table with chairs that accent your kitchen style. You could even incorporate a banquette that serves as the ideal breakfast nook or a gathering place for an intimate lunch with friends. The materials you choose bring out your style through color, texture, and patterns. Unusual materials, textured tiles, environmentally friendly materials all offer an insight into your personality and make the kitchen your own creation. Source materials from your area, such as local stone, reclaimed barn wood, or locally manufactured tiles to give a unique edge to your design and a connection to the local community. Most kitchens tend to use a neutral palette, so including a feature color offers a chance to add a favorite color to an otherwise relatively neutral landscape. Your best bet is to incorporate a feature color in something that can be easily replaced such as paint color or island barstools. Mixing up colors or materials for your countertop creates a point of visual interest, perhaps highlighting a particularly favorite material used in one section. It also helps to create specific areas designed especially for personal interests such as a marble countertop for baking or perhaps a warm wood countertop to create a dining space. What better way to bring your personality to a new kitchen than by incorporating the ultimate customized kitchen accessory, the Galley Workstation. It transforms your otherwise standard kitchen sink into a multi-purpose work area with the flexibility to be used for chopping and cooking one minute and serving up appetizers to guests the next. Make your kitchen design your own by adding unique design elements that bring out your personality and style. Contact us today to find out more!